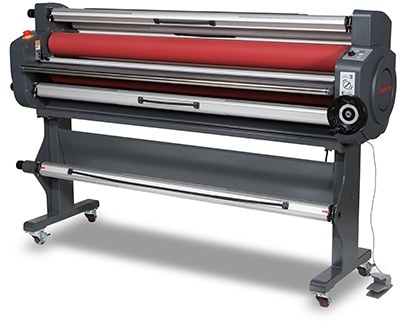 Mimaki Engineering Co., Ltd. (Mimaki), Headquartered in Nagano Prefecture, Tomi City; President, Kazuaki IKEDA, announced today the release of [LA-160W] [LA-170W], in November 2017, Mimaki genuine warm　laminator, suitable to laminate UV print, following to the provision information of [UCJV300-160] [UCJV150-160] (hereafter called [UCJV300/150-160]) (*1) of new launching. [LA-160W] [LA-170W] achieved the maximum laminating speed 7,500mm/min. (*2) and usable for UV print laminating, too. Simultaneously, Mimaki genuine laminating film, [Mimaki Vision Laminate 310-137(Gloss)] (hereafter called [MV Laminate 310]) is also going to sell with an advantage to reduce the silvering (*3) while laminating to UV print. *1 Both products are planned to launch in November 2017. *3:Silvering = Whitening phenomenon of graphic by engulfing air babbles on laminating. The unevenness of UV ink on the printed surface is likely to generate silvering by conventional laminating film. [MV Laminate 310] applied more soft adhesive and weaker film in stiffness than the conventional ones, which reduces the silvering of UV print laminating to retain the essential beauty. The surface of UV printing appears often unevenness and matte finish without glossiness. However laminating by [MV Laminate 310] can make the surface much more flat and provides the glossy finish and color brightness.